Before and after pictures. Paint, fabric, and decor colors inspired by ebhues color analysis. The average client of EleaBlake Cosmetics is probably not a 50-year-old male. For nearly 30 years I was married and thus my entire design experience was the phrase, "Sounds good honey." Now divorced, and starting over with a new house, no possessions, and no clue on how to proceed, I was overwhelmed at the prospect of what colors to paint my home and even more terrified at matching furniture and other decor. Luckily, I have a friend who not only is brilliant with makeup, but is a pioneer in color theory. I figured if colors could be found that looked good on me, then I would have a template for picking colors that would work together in my house. So, the next thing I knew I am sitting in a chair with a gray apron on with Darin laughing behind me flashing color boards next to my face asking me which looked better -- "One or two..." The process was actually quite enlightening and fun as I had flashbacks of clothes in my past that looked great (and terrible!) on me that matched with Darin's guided selections on what to wear and what to avoid. I leave with 36 color swatches that are all ideal for Trevor. I select a gray for my walls and a white tone for my trim. I pick a burgundy red for all of my cabinetry and eggplant purple for an accent wall in my bedroom. I hand the actual EB color swatch to my painter and ask him to match these bad boys as close as he can! The painting crew all thought my purple wall was going to look ridiculous; when they painted it they were all blown away and told me it was the best looking wall they had ever done! I would have never had the confidence to pick that color without Darin's EB swatches. With my newly painted house I used my swatches to pick the colors of my sofa, bedding, lamps, ottoman, bench, vase, curtains, and even my dog's bed and food dishes! I did not buy a single throw pillow without those swatches. These swatches did not limit me, slow me down, or encumber my creativity. Rather they expanded my options, expedited my selections, and ignited a creativity and interest in designing my space that I did not even know existed in this black t-shirt and jeans middle-aged guy. Everyone should visit Darin Wright at EleaBlake Cosmetics and have their personal ​ebhues color analysis. Now I have a space I absolutely love because I am surrounded by colors that resonate with me and that all look fantastic together. In fact, I think I am now even ready to buy an eggplant colored t-shirt! 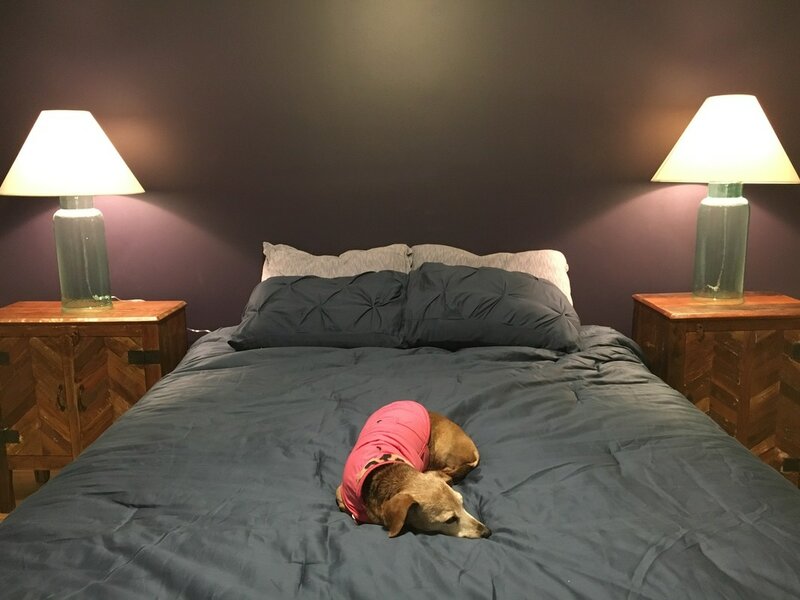 Belle also approves of the eggplant accent wall, green lamps, and navy blue comforter.